Honda lawn mowers. Very smart. 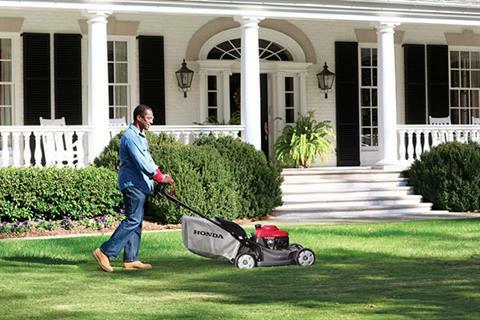 Looking for the ultimate lawn mower? You've found it. SIMPLE ELECTRIC START: Effortless self-charging key start. CRUISE CONTROL: SIMPLE, PRECISION SPEED CONTROL: Honda's hydrostatic Cruise Control allows precise speed control that's fully adjustable from 0 - 4 mph. ROTO-STOP®: STOP THE BLADES WITHOUT STOPPING THE ENGINE: Honda's Roto-Stop® blade stop system allows you to step away from the mower, without having to stop and restart the engine. 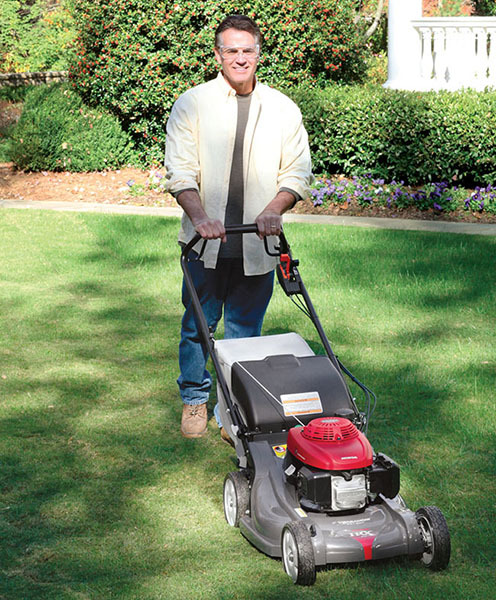 Move items out of the way, empty the bag, or take a break, without having to restart your mower. 4-IN-1 VERSAMOW SYSTEM™ WITH CLIP DIRECTOR® - MULCH, BAG, DISCHARGE AND LEAF SHRED WITH NO TOOLS OR ATTACHMENTS REQUIRED: Honda's revolutionary Versamow System™ allows you to mulch, bag, discharge, and shred leaves - or even a combination of mulching and bagging! Just slide the convenient Clip Director® knob to choose how much grass is bagged or mulched. No tools or costly attachments are needed. It's the ultimate in convenience and versatility. 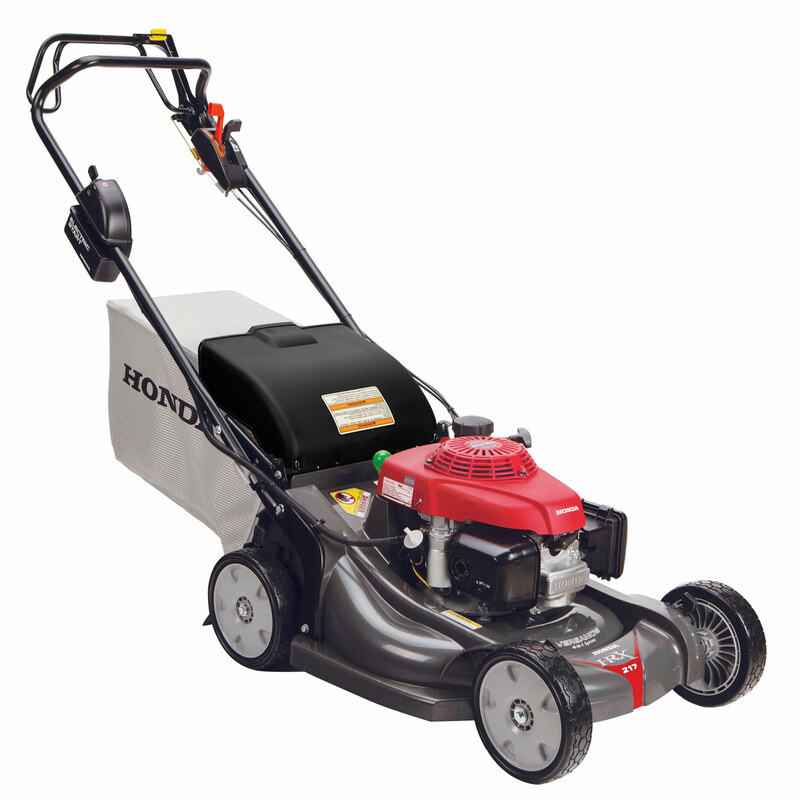 HONDA MICROCUT® TWIN BLADES: SUPERIOR MULCHING AND BAGGING: Honda's exclusive twin blade MicroCut System® uses four cutting surfaces that result in ultra fine clippings for superior mulching and more clippings per bag. The end result? A perfect cut, less time emptying the bag, and less work for you. 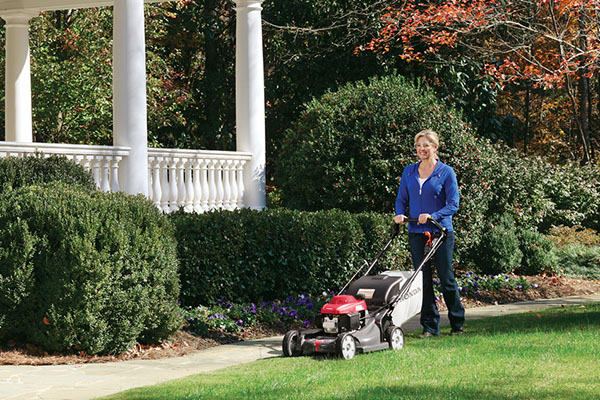 RUST-FREE, NO-DENT NEXITE® MOWING DECK WITH LIFETIME WARRANTY: The HRX's 21 in. deck is made of NeXite®. This high impact resistant material does not dent, rust, or corrode over time. So durable it comes with a lifetime warranty! RELIABLE HONDA GCV190 ENGINE: Easy-starting, fuel efficient, and powerful, Honda's premium residential GCV190 engines are legendary for providing years of reliable service. All Honda lawn mower engines are certified to meet 50-state EPA and CARB emission levels. HONDA AUTO CHOKE™ SYSTEM - EASY STARTING: No engine choke required! Just start the mower and go! The adjustable throttle control allows engine speed to be adjusted to idle when emptying the grass bag or transporting the mower. 5 YEAR RESIDENTIAL WARRANTY: You can rest easy, knowing your lawn mower is covered from top to bottom for 5 full years. WANT TO MULCH, BUT WORRIED ABOUT LEAVING CLUMPS? NO PROBLEM: The Versamow System™ helps you to mulch or partially mulch even in severe conditions. Just adjust the 10 position Clip Director to the right setting for your lawn. GO FURTHER BEFORE EMPTYING THE BAG: Smaller grass clippings mean more grass fits in the bag. So you can mow up to 30% farther before you have to empty the bag. EASY, CONVENIENT REAR DISCHARGE: The HRX has a convenient rear discharge door that improves maneuverability, eliminating the need for a separate discharge chute attachment. Clippings are directed out the bottom at the rear of the mower. MAKE QUICK WORK OF LEAVES, WITH NO ATTACHMENTS NECESSARY: The HRX Versamow System™ makes leaf shredding easy. Tiny pieces minimize the use of leaf bags for collecting debris. No attachments or tools are necessary. 3-POSITION QUICK RELEASE ADJUSTABLE HANDLE: The quick release handle is easy to adjust to one of 3 positions for comfortable mowing. Or fold it over for more compact storage. LARGE 9 IN. BALL BEARING WHEELS: Ball bearings in all four wheels offer better maneuverability, smoother drive, and increased durability. 7 POSITION CUTTING HEIGHT ADJUSTMENT (0.75 - 4 IN. ): Convenient height adjustment levers to set mowing height for lawn conditions. LARGE 2.5 BUSHEL CAPACITY GRASS BAG: Our large capacity grass bags are balanced so they are easy to empty, saving you time and effort. MANUAL FUEL SHUT-OFF VALVE: The fuel valve can be shut off for transport, storage, or to perform maintenance.